STATE COLLEGE, Pennsylvania — Hotel values are set to increase through at least 2014, led by particularly strong gains in the economy segment, according to the latest Penn State Index of U.S. Hotel Values. Hotel values are projected to increase 8.8% during 2013, equating to a per-key value of $106,957. During 2014, values are projected to increase 6.9% to a per-key value of $114,334, according to the index. “Hotels continue to be a preferred investment during uncertain economic times. U.S. gross-domestic-product growth is expected to continue, but not at inspiring levels. Long-term interest rates are anticipated to remain fairly low. Unemployment is expected to continue to hover in the 7% range, keeping consumer spending relatively strong,” said John O’Neill, director of Penn State University’s School of Hospitality Management and creator of the index. “Occupancy levels will be at or near their historical peak. Average daily rates are expected to register moderate gains. Construction activity is expected to remain moderate, or at least well below historical averages. Commercial and leisure transient hotel room demand is expected to stay pretty strong, whereas group demand is a bit dicey. “Average U.S. hotels are expected to remain profitable in the near term,” he said. NOTE: This article is largely reprinted from a recent article by Patrick Maycock, Editor-in-Chief, HotelNewsNow.com. I thought my readers would learn from it. A July 15, 2013 article in The New York Times says that travelers in the United States will spend about $273.3 billion on the road in 2013. That’s a 4.3 percent increase over last year, and a reflection of stronger growth in domestic travel as the national economy stabilizes. Of the estimated $273.3 billion, about $117.1 billion will be spent on group travel — meetings and conventions, conferences, incentive trips and the like. And $33.1 billion will be spent in the United States on international travel. The information comes from a report that trade group Global Business Travel Association has released preceding its annual convention, which will be held early August in San Diego. Americans plan to spend more on travel this summer than last year, according to a recent Orbitz survey. More than half plan to spend over $1,500 on the trip, while only 39% said that in the 2011 survey. 77% plan on taking a vacation this summer. 56% plan to drive even though 60% said gas prices would impact their travel planning. July is the hot travel month, with 31 percent saying they plan to travel during the month. Orbitz said that New York City moved up from the sixth most popular destination in 2011 to the number two spot this year. Nearly half of survey respondents are getting summer travel ideas through social media platforms such as Facebook and Pinterest. Most American consumers plan to travel domestically (81%), and 19% are planning to travel internationally this year. Help Springwood Hospitality “Stick it to Hunger” Today! Springwood Hospitality gladly supports the local food bank and is conducting a food drive April 11th to April 28th. Thank you for joining us in the fight against hunger! Is your hotel too hip for you? 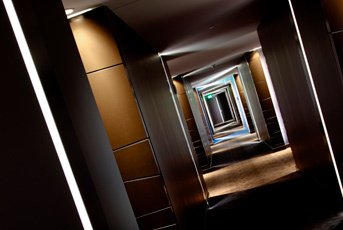 The hallway of the W Atlanta Downtown illustrates the writer's comments. Some of the hallmarks of cutting-edge urban hotel design — lobbies that double as party lounges, low-slung seating that (for those of a certain age) make getting up gracefully a challenge, complicated in-room control panels that bewilder, oddly placed fixtures (think bathtub in the middle of the guestroom) and lighting so dim it’s hard to see what’s where — are signs that your hotel might be too hip for you. “There are people who skew older but are young at heart and want to hang out in a more youthful environment,” says Chip Conley, 50, executive chairman of Joie de Vivre Hotels. “If the type is too small on the menu, they’ll just put on their glasses and deal with it.” The 35 boutique hotels in the Joie de Vivre catalog were created by using magazines (Real Simple meets Dwell) or movies stars (Gwyneth Paltrow meets Harrison Ford) as guiding principles in their design. The idea is to appeal to guests’ lifestyles. But can a hotel be too hip? Yes, says Conley, if it isn’t mindful of its target audience. Hotel consultant Daniel Edward Craig says some hoteliers have gotten so immersed in cutting-edge design, they’ve neglected service. “If the service and staff are warm, they can overcome the initial intimidation you feel when you walk into a foreign environment. The problem is that some hotels have put so much money into design and hired the wrong staff,” he says. Other frequently travelers are confounded by the tech-tronics of cutting-edge hotels. Tracy Kulik, 55, spent a fitful night at the James Hotel (now the Hotel Theodore) in Scottsdale, Ariz., when she couldn’t figure out how to turn off the LED illumination on the headboard and bed base. And she found the shower in her room at Washington’s Donovan House hotel so peculiar (it protruded into the bedroom and glowed), she snapped a photo with her cellphone. COMMENTARY: My family will be staying at the leading-edge-style Curtis Hotel in Denver this summer. I’ll report back to you how the middle-aged parents – vs. the two teenagers who will be with us – view the atmosphere. I agree with consultant Eisenstodt that hotels’ pursuit of an ever narrower target market can repel some of the fat part of their market. (Double entendre intentional) Time will tell if these moves are wise. I have my doubts about them except in the largest U.S. markets. It’s also cool that Jayne Clark shares an interview with a traveler from our home base of York, PA. Trust me, we don’t often see that! In a Feb 16, 2011 article in MarketNews.com, Claudia Hirsch chimes in on what all of us are seeing. The following are some quotes from her article. Springwood has seen the same trend. Our rates are up across the board, and occupancies are improving, but we have yet to see pre-recession ADR’s. It could be a couple more years until prices fully recover. According to a recent study conducted by the National Business Travel Association and reported by Bloomberg, business travel spending should grow 5% in 2011. They credit both a growing economy and stronger corporate profits. Business travel in 2010 grew 2.3% in 2010 according to NBTA estimates. We saw this impact anecdotally in our hotels that cater to business travelers, who started showing up again in stronger numbers in 2010. This factor helped fuel the nearly 16% revenue increase in 2010 at our Homewood Suites by Hilton (a great brand, by the way). NTBA points out that international business travel rose a whopping 16.9% in 2010, fueled by export-driven commerce. That’s a huge gain, and it is an actual benefit of the weaker dollar. Let’s hope that the federal government someday sees the wisdom of promoting this valuable export as a way to grow the economy and ease our trade deficit. At Springwood, we build our business on relationships, because we believe that relationships drive not just our business, but all business. There is no better way to build them than face-to-face! What Even is AirBNB Anymore? Home2 Suites Frederick, MD Opens Today!